The U.S Department of Commerce reports that although women till almost 50% of jobs in the U.S economy, they only hold less than 25% of STEM jobs. The Burning Glass research project found that STEM careers earn the highest starting salary for those with a Bachelor's degree. More importantly, the women that enter STEM earn 33% more than women who enter non-STEM jobs. The well-paying and high-quality jobs in the STEM field give our future generation opportunity for growth, innovation, and stability. However, more women choose to pursue other paths such as education and healthcare. The gender disparity in the workplace, particularly in STEM careers, is an ongoing issue. Across the world, we continue to see inequality in the ratio of female to male employees, differences in pay within the same job, lack of women in executive roles, and much more. Many of these issues have been researched for decades and we are starting to see a change with more women entering STEM and a smaller gender pay gap. However, there is still progress to be made for us to truly change the current work culture in STEM. SAFG hopes that one day, the gender disparities in the industry will no longer exist. How can we help tackle this problem? It begins with promoting strong female role models for girls to look up to at a young age. Girls are more likely to resonate with someone who looks like them or someone who encountered similar life experiences. Studies across the US have found that girls are most likely to become disinterested in the STEM subjects during middle school because they don't think they fit into what society views as a typical STEM student. Strong female role models can change this way of thinking. Girls who are exposed to successful women in STEM can become inspired and driven to follow that same path. A MIT study co-authored by economist Esther Duflo describes this as the role model effect. "We think this is due to a role-model effect: Seeing women in charge persuaded parents and teens that women can run things, and increased their ambitions. Changing perceptions and giving hope can have an impact on reality." Furthermore, women also need role models in the workplace. Almost 40% of women who study STEM either leave the field or never enter it at all (Carnegie Mellon Study). This is disheartening because we encourage girls to find passion in STEM and we want our girls to succeed in the industry to become the next generation of role models. However, it is difficult because of the lack of diversity in STEM today. As of 2017, only 11% of executive positions in Silicon Valley are women. Women who first enter STEM need to see themselves reflected in their environment. These women can succeed with mentorship and guidance from other women who have experienced the work culture in STEM. We need more women in leadership roles so that they can become role models and build a working environment for other women to succeed. Our future scientist, engineers, mathematicians, and more need more women to look up to. SAFG's mission aims to help combat some of these issues by keeping kids at an early age engaged in STEM for the long term. We hope that our program can be an experience that inspires girls to pursue STEM careers in the future and to become the next Mary Jackson or Sheryl Sandberg. We want girls to be the next generation of leaders who will help govern the STEM industry and provide an environment for all minorities to succeed. We continued our Spring After School Programs this past April at Martin Luther King, Jr. (Oakland), Emerson Elementary (Oakland), Chabot Elementary (Oakland) Temescal Library (Oakland), Jefferson Elementary (Berkeley) and Anna Yates Elementary (Emeryville). We are also thrilled to add to the SAfG Family Sankofa Elementary in Oakland bringing the total of girls served this spring to 145 girls. Across the sites, girls are exploring electrical circuits and food science as well as our newly designed Storybook Science: Engineering By the Book. Girls have the opportunity to engineer happier endings to a variety of familiar tales. With hands-on design challenges, the girls begin each class with reading a story followed by using the Engineering Design Process to guide their work. For example, they have helped Little Red Riding Hood deliver get-well goodies to grandma with a carefully designed zip line! SAfG is also rolling the Storybook Science to its drop-in classes at 81st Ave Library and Main Library branches in Oakland. We are excited to see families work together on the design challenges as well as offer opportunities to children in after school programs at nearby schools. As spring programming comes to an end, we are busy ramping up for our busy summer schedule! We are offering two weeks of Carnival Science where girls can try their hands at balloon engineering challenges, experiment with force and balance in games of skill and explore the science behind their favorite carnival treats. They will share the week of "wow's" and "why's" in a kid-run carnival with a science twist at the end of the camp. Our K-2 camp is full but accepting registrations for a wait-list, but there are still a few openings for the 3rd - 5th grade camp from June 18 - 22, 2018! SAFG has a robust library program this summer appearing at eight different Oakland public libraries. Click here for the full schedule. All library programs are open to the public of all ages! Hope to see you there! Scientific Adventures for Girls hosted its first ever Family STEAM (Science, Technology, Engineering, Arts, and Math) Night this year at three of schools: Anna Yates Elementary in Emeryville, Emerson Elementary in Oakland and MLK / Lafayette Elementary in Oakland. Families were invited to partake in hands-on, interactive activities around an Earth Day theme. There were eight stations and activities that reflected various STEAM subjects and demonstrated lessons on environmental protection: building renewable energy model cars; making water filters; observing earthworms; making Earth-friendly slime; making seed bombs; and dissecting and pulverizing flowers. At Anna Yates Elementary, we were fortunate to have the Emeryville Police Department and the East Bay Energy Coalition host booths. At Emerson Elementary, East Bay Depot for Creative Reuse hosted a recycled art booth and donated art materials to the school. Over 465 people attended our events, and many members of the community supported our efforts. Afterschool staff and school administrators helped facilitate the events, and companies and organizations including MOCHA, Chabot Space and Science Center, Museum of Tech Innovation, Shell and Tesla donated tickets, t-shirts and gift cards for the raffle we held at the end of each event. Our event was staffed with SAFG teachers and amazing volunteers. We enjoyed seeing families participate in STEAM activities together and we hope we inspired them to continue their engagement in STEAM at home. Thank you for everyone who helped support this event. Our hope is to have similar events in the future that span across all of our school sites. SAfG is thrilled to share that it recently received grants from Bayer USA Foundation and Wells Fargo. Both companies are committed to supporting girls in STEM and youth in Oakland — a big shout out for their generous support! This spring SAfG had the privilege of working with the Energy Coalition (EC). With the support of an EC grant, SAfG will bring EC's Climate Action Program to its library programs in Oakland. SAfG looks forward to to this new partnership! SAfG is honored to receive a grant for the third year in a row from both the American Eagle Outfitters Foundation (AEO) and the Oakland Berkeley Association of Realtors (OBAR). Thank you AEO and OBAR for your incredible dedication to girls in STEM and your continued support in 2018. This funding will help SAfG reach more girls in the Oakland - East Bay area! With the very generous support from Wareham Development and the Nancy P. and Richard K. Robbins Family Foundation, SAfG will continue its summer STEM programs at the Emeryville Recreation Department where SAfG expects to deliver engaging, hands-on science enrichment to over 125 girls and boys. SAfG girls and their families were surprised with two unique opportunities. First, the Warriors Foundation donated tickets to attend a Golden State Warriors basketball game in honor of Women's History month. Secondly, Taylor Swift donated tickets to attend her concert in Santa Clara in celebration of "awesome girls in science". Many thanks to both for recognizing the importance of girls in STEM! These are memorable, impactful experiences; we are so appreciative. Finally, SAfG would like to recognize its relationship and work with Bay Area for Community Resources (BACR), an afterschool agency. 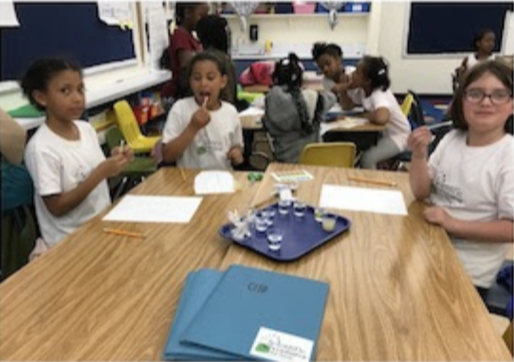 Through our partnership with BACR at a number of the schools SAfG serves, we are able to reach more girls in K-5 and together we are changing the face of science! Thank you to BACR's program manager Gabrielle Guinea for helping make this possible! If you would like to donate to support girls in science, please go to our website. Every dollar helps to send another girl to one of our after school science classes. If your company provides small grants to organizations like SAFG and would like to sponsor a class, please contact us — we would love to apply! At our family STEAM Night, one of our activities included earth friendly, edible slime. Below are the instructions for you to try this activity at home! Measure 112 cup flax seeds and 2 cups of water into a sealable container and store overnight in the fridge (12-24 hours). The next day your seeds should be nice and gelatinous. Stir to break up any clumps, then add 2 teaspoons of xanthan gum and whisk or shake in the container. It won't completely mix in but that is okay. If the slime is still very sticky, add more cornstarch 1 Tablespoon at a time and knead between each addition. If the slime is crumbly and not stretchy, add a teaspoon of water to correct and knead well. If it dries out, wet your hands under the sink and knead them into the slime - this should be enough water to rehydrate it. It is edible, which means it is perishable. It will need to be stored in the refrigerator in a sealed container when not in use for up to a week.